Real Housewives of New York star Sonja Morgan is good friends with rookie co-star Aviva’s Drescher’s ex-husband, Harry Dubin, and Aviva has made it clear she is not happy about it. After last night’s episode, Aviva took to her blog to let the world know how she feels. Sonja has yet to respond to Aviva’s statements. Maybe she has more important things going on, such as a completely brand new look, as seen on the GLAAD red carpet last night! Instead of her usual short, mousy blonde hair, the 48 year old reality star now sports long, sleek red locks. What do you think? Personally, I think she looks like a whole new person! It is a dramatic change, but a good change, in my opinion. See the above picture for the before and after look to compare. 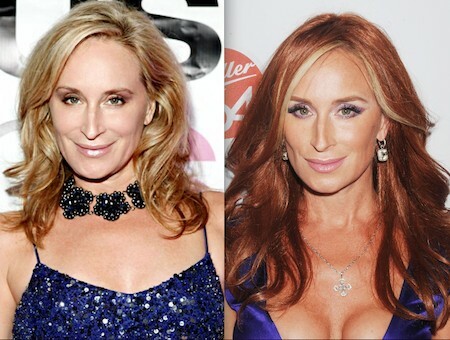 Does Sonja Morgan Need a Refresher on the Rules of the Pecking Order? Ramona Singer’s Exact Words to LuAnn de Lesseps Revealed!